« It’s Not About the Beer…. 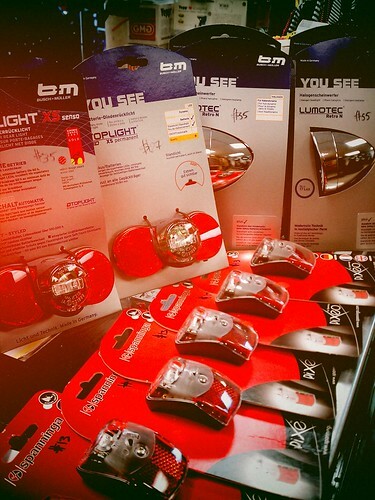 We just got a big batch of dynamo and battery powered lights at the Flying Pigeon LA bike shop. This includes some special dynamo-powered head and tail lights, as well as some battery powered lights. Our dynamo headlight selection (as of today is as follows): B&M Lumotec Retro Senso Plus headlight ($60); B&M Lumotec Retro N ($55); the Lumotec IQ Fly Senso Plus ($88), and a few AXA Pilot Steady ($40) and Sprint Steady ($35). Our tail lights powered by batteries include: B&M Dtoplight XS Permanent ($27); B&M Dtoplight XS Senso ($35); Spanninga Pixeo Xb fender mount ($13). We’ve also bought a bunch of headlight bulbs (both 3 and 2.4 Watt) for the B&M Lumotec Retro series lights ($8/ea. ).